On Sunday, July 24th, a horse named Check Mate was severely injured at the Cheyenne Frontier Days Rodeo (CFD) in Cheyenne Wyoming . SHowing Animals Respect and Kindness (SHARK), who is video-documenting the entire rodeo, captured the event and is now releasing it to the media. Check Mate was later killed due to the severity of her Injuries. Check Mate was only the latest victim of the "rookie saddle bronc" event; in 2009 another horse named Strawberry Fudge was killed. SHARK captured her death on camera and that video is available on this link. A horse named Cajun Katy was also injured and taken away in 2009, but rodeo promoters have refused to admit what happened to her. Her video can be seen here. In the previous four days, four calves and two steers, who were injured so badly that they were unable to either stand or leave the arena on their own, were put on a small truck and hauled out of the arena. Another steer had an obviously serious leg injury. Videos of these injuries can be seen on this link. Sadly, local media has declined to cover these injuries. SHARK president Steve Hindi and associates have been at each rodeo performance. Hindi issued this statement: "While rodeos are generally cruel to animals, the Cheyenne rodeo is outrageously and intentionally brutal, and a shame on the entire country. Sponsors and attendees of this cruelty should be ashamed of themselves. The media that whitewashes such abuse don't deserve to be called journalists." The rookie saddle bronc event has a history of horses out of control and taking bad falls - these two deaths and a probable third show how dangerous the event it is, yet the CFD allows it to go on. The Professional Rodeo Cowboy Association (PRCA), a rodeo front group, claims to have animal welfare standards, but this shows how phony and useless they are. 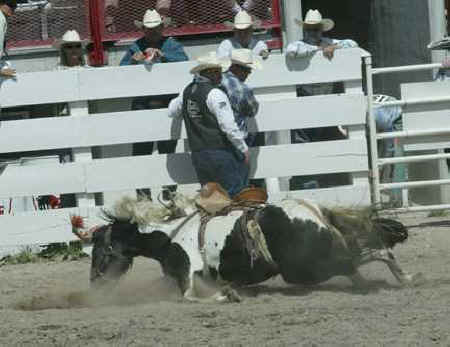 The reality is that rodeos are brutal events where animals have and continue to suffer grave injuries and death.